Ralph Waldo Emerson? Harrison Emmerson? Harrington Emerson? Anonymous? Oddly, I have not found any instances of this expression in the 1800s. Yet, Emerson died in 1882. Would you please determine the origin of this statement? Quote Investigator: There is no substantive evidence that Ralph Waldo Emerson crafted the words above. 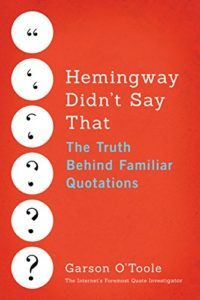 QI believes the passage evolved from statements made by Harrington Emerson who was a prominent management consultant and efficiency expert during the early decades of the 1900s. The misattribution occurred because of the shared last name of “Emerson”. A version of the quotation was labeled with the single name “Emerson”, and some readers assumed that the creator was Ralph Waldo Emerson instead of Harrington Emerson. Indeed, the fame of the transcendentalist thinker has long eclipsed that of the efficiency engineer, and the error has been propagated via numerous periodicals and books over the decades. The passage above did not exactly match the statement given by the questioner; however, QI believes that the modern phrasing was derived from the 1911 text via the commonplace process of imperfect transmission over time. In conclusion, QI believes that the 1911 excerpt should be credited to the engineer Harrington Emerson. The passage has evolved to yield multiple variants during the past one hundred years. The linkage of the quotation to Ralph Waldo Emerson was spurious. The error was probably caused by the ambiguity of the compact label: Emerson. Images Notes: Portrait of Ralph Waldo Emerson engraved and published by S.A. Schoff based on a drawing by Sam W. Rowse accessed via Wikimedia Commons. Cover of “The Twelve Principles of Efficiency” by Harrington Emerson accessed via archive.org. The cover has been cropped and retouched. Portrait of Harrington Emerson from “The American Magazine” issue dated March 1911 accessed via Wikimedia Commons.